Sometimes I think we get so busy trying to unpack and implement Common Core that we forget one of our important roles in making this implementation stick: helping our larger communities, especially parents, to understand it, too. With back-to-school nights on the horizon and parent communications getting underway, we wanted to fill your backpocket with some resources you can turn to when parents start to ask questions. I’m sure that not only will parents find these helpful, but these succinct and friendly resources will continue to bolster your confidence as well. 1. Learning to Read the Core with Sarah Brown Wessling: Even though this webinar is for teachers, many parents have found it straightforward and accessible. 2. PTA: Parent’s Guide to Student Success (available in Spanish too): These concise documents will give an overview of Common Core throughout the grades in parent-friendly terms. 3. Parent Road Maps to the Common Core from Council of the Great City Schools: With more detail than the PTA guides, these maps — ELA and Math — hone in on some standards and offer ways to connect with them at home too. 4. Frequently Asked Questions on the Common Core: From the writers of Common Core, this page addresses questions they often field. 5. CCSS Changes and their Impact on Teaching: Read and listen as I address some of your questions about the Core’s impact on the classroom. Many parents (and teachers, too) will want to see what Common Core looks like in practice. One of the tenets of the Common Core is the idea that we need to prepare students for college and career — arm them with the thinking and communication skills that will help them analyze and apply their learning to different situations. One of these skills is using collaborative discussion to communicate an argument and cite evidence that supports their opinion in order to synthesize information. This video goes inside a high school to show what that looks like. With younger students, teachers will be focusing on building a deeper understanding of fewer key concepts. In math, that means a deeper understanding of multiplication and division instead of memorization. This video shows how students make sense and defend their ideas to achieve this goal. As I think about these resources, I’m reminded that the conversation parents most want to have is the one with us, the teachers, who will connect their child and the Core in meaningful ways. In preparing to talk with parents, here are a few topics I find myself coming back to over and over again. This is not a federal mandate or curriculum. In fact, these are state standards which means each state could choose whether or not to adopt them. Common Core isn’t going to take away local control. A lot of people are worried that because the standards are common that everything else (teaching, curriculums, materials etc.) will be common, too. Actually, the standards aren’t a curriculum which means that states and local districts still get to decide how they’ll meet the standards. You will feel some shifts… and that’s a good thing! It’s true that Common Core should cause some shifting in what school looks and feels like. In other words, you’ll see your children doing more than finding answers and completing tasks. Instead, you’ll hear them reasoning, you’ll see them working through more complex problems, and you’ll enjoy watching them read both fiction and non-fiction. Sarah Brown Wessling is a high school English teacher at Johnston High School in Johnston, Iowa. 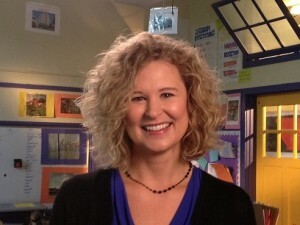 She shares half of each day with the Teaching Channel where she serves as their Teacher Laureate to help fulfill their mission of elevating and celebrating teachers. Sarah is also author of Supporting Students in a Time of Core Standards and delivers professional development around the country.